Earlier this week I blogged here about the thinspiration community—which encourages anorexic and bulimic behaviors and insists that eating disorders are not mental illnesses but admirable “lifestyle choices”—and its use of Twitter to share tips on how to be “better” at your eating disorder. This, ladies and gentlemen, is what fat-shaming looks like. Summer’s coming, and with it, hot weather and skimpy clothes. Better look “good”—that is, skinny—when it arrives. Because fat people are disgusting, right? I tweeted at the company and told them that I thought they should take the sign down, and they complied. They apologized, saying they were only trying to highlight the health benefits of oatmeal. I call shenanigans. 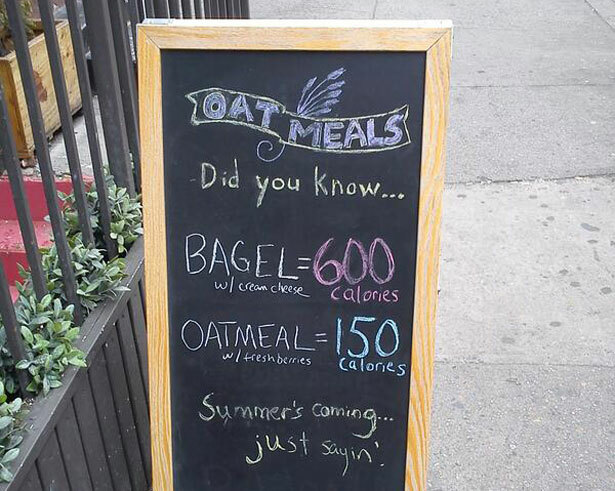 If the sign had simply compared the calorie counts of the two breakfasts, that would have been fine. But there’s nothing healthy about reinforcing the hateful attitudes we hold in this culture toward people who are overweight. After Oatmeals agreed to take the sign down, and after I thanked them, some other blogs picked up the story. The vitriol that was unleashed—in comments sections, in my Twitter feed, and in my e-mail inbox—was breathtaking. Leaving aside the comments about my stupidity, my oversensitivity and my weight, the reaction to my argument that the sign was “fat-shamey” was, in itself, really fat-shaming. Fat people are hideous. Fat people are lazy. Fat people are fat by choice. Fat people don’t know they’re fat. Fat people are too dumb to make smart choices. Chloe is fat and should therefore shut up, because fat people’s voices don’t count. In that kind of discourse, it becomes crystal clear that in America, “fat” is not simply an adjective. It carries so much more—if you’ll forgive me—weight, than that. Multiple people pointed to America’s “obesity epidemic” as justification for heaping scorn and cruelty on overweight people, as though a national food policy problem can be solved by insulting individual human beings. True, some people are genuinely concerned about the “obesity epidemic.” But when I hear someone defend their hatred and discrimination with the words “obesity epidemic!” all I hear is, “I lack compassion for an increasingly populous group of my fellow citizens!” Oh, but for their own good, of course. Others insisted that fat-shaming simply isn’t real, that it’s something that overly-PC liberals thought up so they can be offended by anything and everything. Fat-shaming isn’t real? Do you live in a world without US Weekly and People, without The Biggest Loser, without sitcoms in which fat people are depicted as stupid, lazy and greedy, their sexual desires painted as hilarious and grotesque? Do you live in a world in which critics comment only on the talent and not on the girth of actresses like Melissa McCarthy and Gabourey Sidibe? In which pundits treat politicians and public figures like Chris Christie, Michelle Obama and Hillary Clinton with respect? Because that is a world in which fat-shaming is not a real thing. It sounds fantastic! It also bears no resemblance to the world in which the rest of us live. That’s how you know that fat-shaming is real. It doesn’t matter how much you weigh, or how big you are (the two, though they’re correlated, are not interchangeable). Your body is being policed. Your body is being judged, and with it, your character and your intelligence. This is fat-shaming. Is it any wonder that millions of Americans are struggling with eating disorders and disordered eating? Fat-shaming, like the myriad factors that contribute to obesity and to eating disorders in America, is systemic. When it comes to food (bearing in mind that, at the core, neither obesity nor an eating disorder is about food), it is imperative that consumers have all the information they need to make the best choices they can about what they eat. It’s crucial that we know more about where our food comes from: who picks it and under what conditions, what they’re paid for their hard work, what farming does to the land and the communities around it, what foods are subsidized by our government, what’s in our food and how it affects our bodies. There are so many things we need to know about what we eat, beyond the simple calorie count. But here is one thing we know for sure: fat-shaming is real, and it is not a solution to our problems. That way lies ruin. That way lies eating disorders and discrimination. Oatmeal might be a healthy and delicious breakfast, but there is nothing healthy—nothing admirable, nothing of social or cultural value—in shaming people for their bodies. Just sayin’. For more on America’s misguided weight ideals, read Chloe Angyal’s post on thinspiration and eating disorders.